Usually artificial gravity is supposed to work by rotating the spacecraft. See diagram A. Wouldn't it be much simpler to simply create it by keeping the craft stationary and running yourself? See diagram B. This way you will experience gravity and get exercise at the same time. My method seems a lot cheaper and is entirely under the control of the individual. Will this idea work? If not why not? Part 2 will be about creating the 'right amount' of gravity. Please don't answer that here. Thanks. Yep, possible. Whether the person or the spacecraft is accelerating (rotationally in this case), the perceived force between the two is the same. See this for some video proof (I am stealing the second link from the comments - thanks @JCRM). Notice that to begin the runners pull themselves into a crouch and push off in the direction they want to run. You touch on this in your question, but ISS astronauts exercise for a chunk of every day and they still have issues with bone density loss and muscle atrophy when they return. So replacing one exercise for another wouldn't alleviate these issues unless astronauts exercise longer and can isolate all muscle groups. You are definitely right that running in a circle is simpler, but it would be hard to isolate and exercise a lot of muscles in the upper body this way, and you would still need some of the exercise machines astronauts use on the ISS. Here's where there is a notable difference in your idea: Things like bone density loss and muscle atrophy are helped by physical exercise, but other things like changing in the shape of the eye's lens are not helped by this. These effects are due to the "microgravity" environment and would be only alleviated by living under 1g (or nearer to 1g). So it's possible that spending all or part of their exercise time effectively under actual acceleration would help lessen these effects. 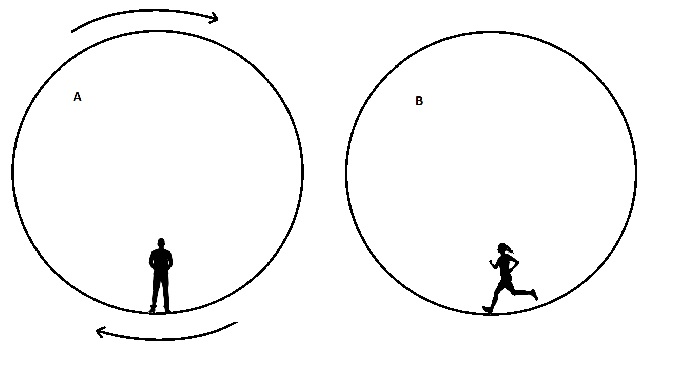 I think at the end of the day, the running is much simpler than rotating the spacecraft/space station. However, you are only simulating gravity for as long as you are running. Spinning so as to effectively simulate 1g (or a decent fraction of that) allows astronauts to live in an environment much more similar to Earth, and alleviates all of the negative effects of "microgravity" with little individual effort. Unless we figure out how to deal with the negative effects long-term, constantly rotating habitats seems the most likely solution by avoiding the problems in the first place. In this Sky Lab video, one can actually see astronaut excercise in same way as you proposed. But, Suppose an astronaut jogs at about $2.5 m/s$ then by the centrifugal acceleration $$v^2/r$$ assuming, 6 m diameter of module, one gets slightly larger than $2 m/s^2$ acceleration. Which is much smaller than acceleration of $9.8m/s^2$ we are used to. Rather I think it will be much simpler and space efficient to use some waist belt to pull astronaut to treadmill for leg excercise. This was done on Skylab, but in e.g. this report on Skylab crew health the running track is not included in the list of exercises. For the first manned mission of 28 days, a bicycle ergometer and an isometric device were used for exercise. (for the second mission) Two modifications of the Mini Gym (MKI and MKII) were made to provide additional exercises for the arms, trunk, and legs. 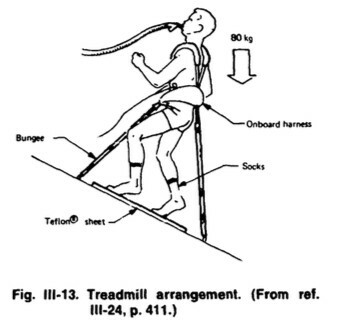 For the third manned mission of 84 days, the crew worked on the bicycle slightly more (71 watt-min kg), used the MKI and MKII exercisers, and in addition typically worked 10 minutes per day walking, jumping, or jogging on the treadmill shown in figure 111-13 (below). So on the Skylab missions, NASA was already working towards the type of treadmill with holddown bands used today on the ISS. I haven't found any NTRS document that mentions the running track yet. Not the answer you're looking for? Browse other questions tagged crewed-spaceflight artificial-gravity design-alternative or ask your own question. Can you ride a bicycle on Deimos? What stability issues plague long artificial gravity cylinders? How the interface between de-spun platform and rotating parts of a spacecraft with artificial gravity could work? Was the Space Shuttle ever rotated to induce artificial gravity? Can artificial gravity be created by spinning the hull of the space station?